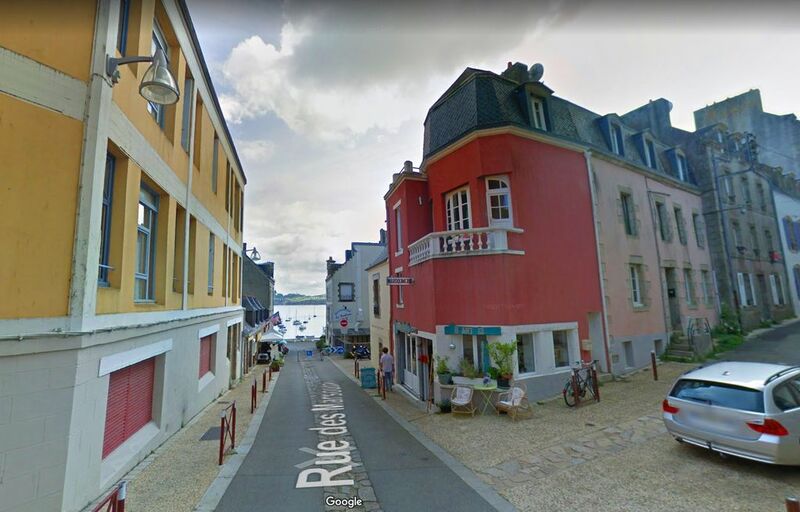 For vacation without car, ideally located in the historical neighbourg of Douarnenez, between the harbour of peach and market of the town, vast flat in duplex appartment entirely renovated with independent entrance, any comfort, well-manicured decoration. Beaches in 500m. The outside picture does not show what is inside, it is a big, spacious and light apartment. Nice little balcony with morning and evening sun. Views from the apartment over the harbor. Well equipped kitchen and big dining aria. Good mattresses on a really king size bed. Nice bars, cafe's and restaurants in the harbor and shops, art gallery's and market hall around the corner. Good place to stay in town and discover Brittany. Un grand appart clair, spacieux bien équipé et conforme à ce qui est annoncé. Il bien placé près du port de pêche, des restos et du centre ville mais aucun problème pour pouvoir dormir s'il on le souhaite. Merci pour l'accueil sympathique et pour l'attention... Nous avons adoré le cidre on repart avec quelques bouteilles... Merci aussi pour les conseils de visites. "We had a great holiday in July 2012 in Douarnenez. The apartment was clean and nice. It is right on the harbor and offers several restaurants nearby. Bakery and supermarket are within walking distance. Near the harbor are two great beaches and Treboul has a very nice harbor, too and two wonderful beaches. We were there with our two children (6 and 3 1/2 years old) and liked the room layout. At the bottom of the childrenroom was a large bathroom and were above the kitchen, the living room, the bedroom and another bathroom. There is a washing machine in the apartment. Parking is possible in the vicinity of the apartment. We will be back!" "Very spacious and light flat in the centre of the old town,equipped with everything one could want. 1 minute from the best fish restaurant in town, and 3 minutes from an alimentation. "A very warm welcome on our arrival from Celine. We thoroughly enjoyed our stay at the apartment and in Douarnenez and would recommend both. The apartment was contemporary & very comfortable; located just by the sea and very close to all the main restuarants, it was a great choice!" "A wonderful and modern and charming apartment perfectly suited for our family of 4. Close to restaurants and the harbour. We loved our stay in Douarnenez. We will definitely recommend this renter. (Text automatically translated) From Rennes and Nantes, head Lorient and Quimper exit Quimper - Douarnenez. Go to Douarnenez (20 km) and take direction City Centre - Port Rosmeur. Down the rue Anatole France, the street porpoises is the penultimate street on the right and the apartment is located on the corner of two streets. For your vacation in Douarnenez you can enjoy our culture and hospitality in a quiet place! The little streets of the old harbour, the corniche and coastal ways, the pedagogic farm of Plomarc' h, so many small nice family walks from the flat, without your car. A lot of artists' workshops where you can see many painting and sculpting exhibitions and The Harbour-Museum (exhibitions, visits of old boats). With Douarnenez as a departure point, in less than sixty minutes by car, your reckless adventures on Crozon 's presqu'ile or in the Cap Sizun will allow you to discover marvellous landscapes, wawes against cliffs, wasteland and its moving colours, little cricks and secret little beaches... Without forgetting the city of Quimper with its very nice architectural heritage, its cathedral, museums, theatres and Henriot pottery. You won't miss Locronan, an historical village of character ,all-stone-built , with crafts. In summer, city beaches are accessible on foot or in less than fifteen minutes by car, big beaches with coast guards, deep in the bay, with nice water temperatures. No doubt you will enjoy your stay! paiement du solde à l'arrivée. Caution de 300€ à fournir à l'arrivée (remboursée en fin d séjour si aucun dégat). Atestation d'assurance villégiature ou responsabilité civile à fournir à l'arrivée.